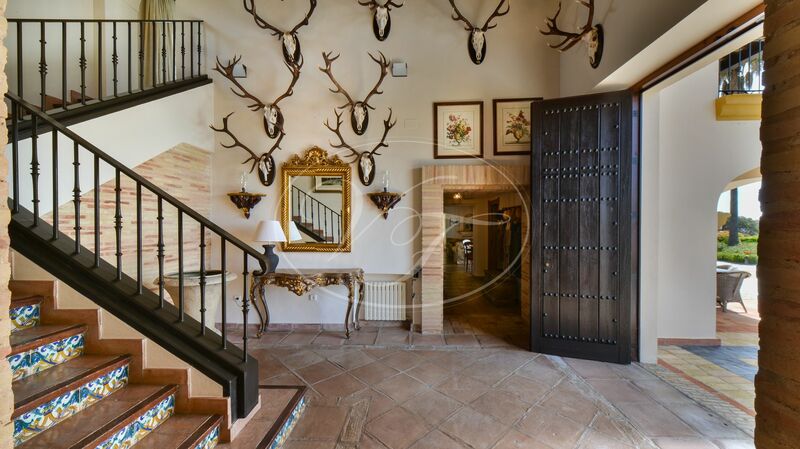 Cortijo El Matuloso is a luxury private hunting and shooting Estate in Huelva, Andalusia, Spain. 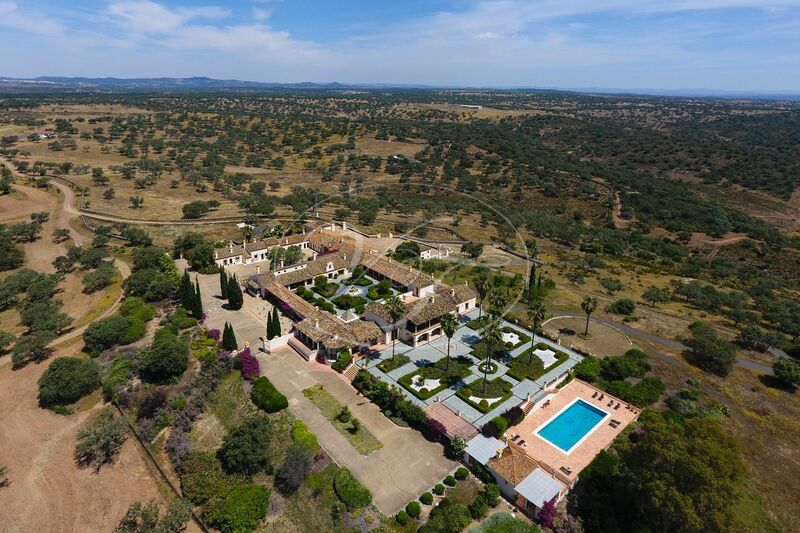 Nearly 1000 hectares sporting estate with an Andalusian styled hacienda of 2400 m² build size, with various patios. The estate has been built and maintained to high quality standards. 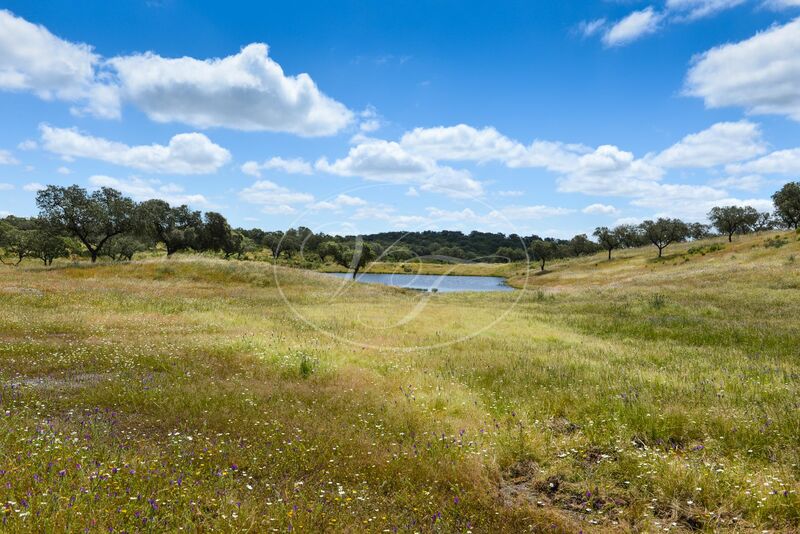 It is situated in the rolling hills, at a 30-minute drive from the beach and Golf courses. One hour to Faro Airport in Portugal and slightly over one hour drive to Seville airport. 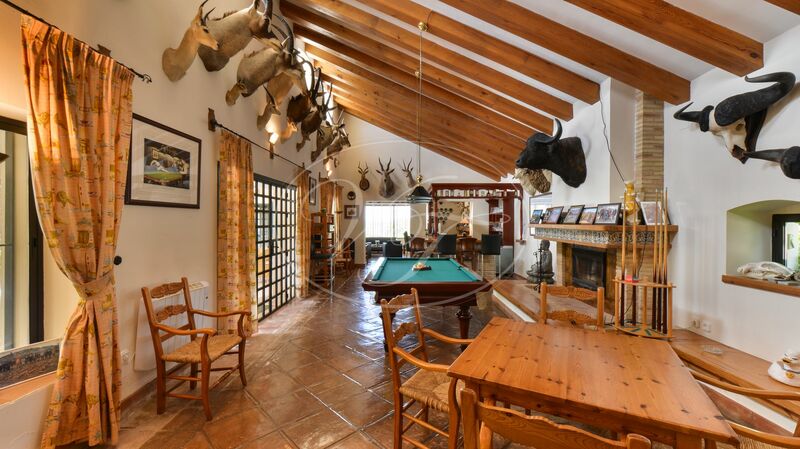 This spectacular country estate is dedicated specifically to hunting, with the focus on big game shooting. 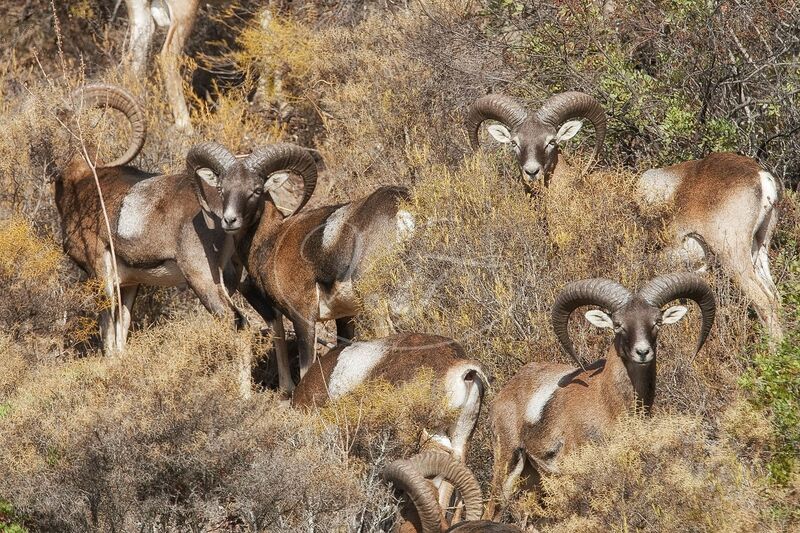 Species hunted are deer, wild boar and mouflon. There is a possibility to combine with small game hunting on f.e. partridge, duck, hare, rabbit, dove, pigeon, sometimes organized in combination with neighbouring shooting estates. 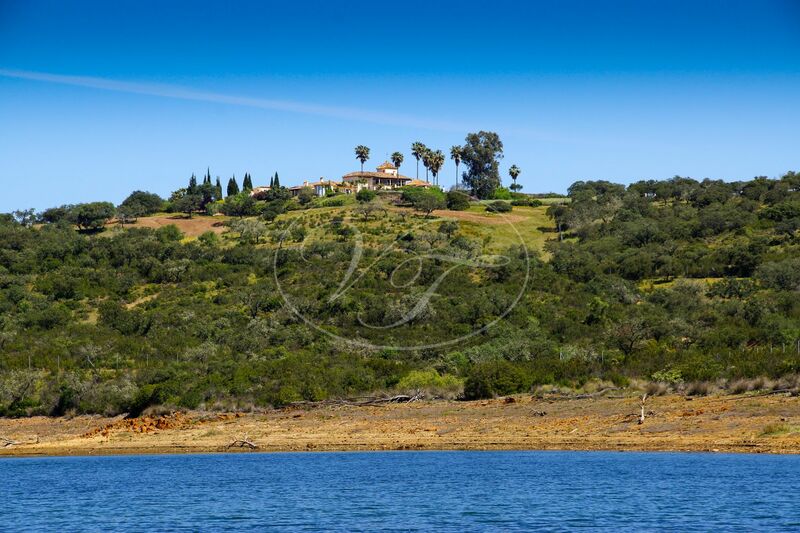 The estate is completely fenced and borders a large water reservoir. An absolutely stunning setting. 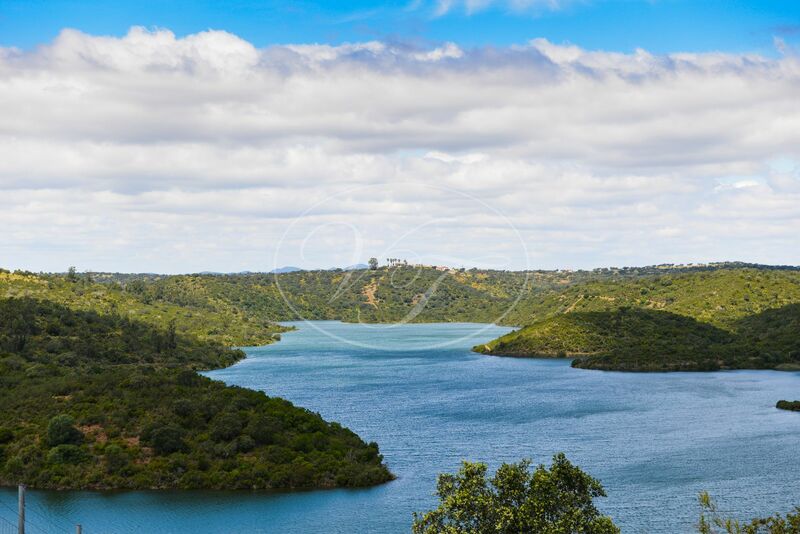 On the finca you will find five more lakes, one could be used for fishing black bass, yet the prime purpose is to provide water for the animals all year round. There is an abundance of water provided by natural springs and several boreholes. 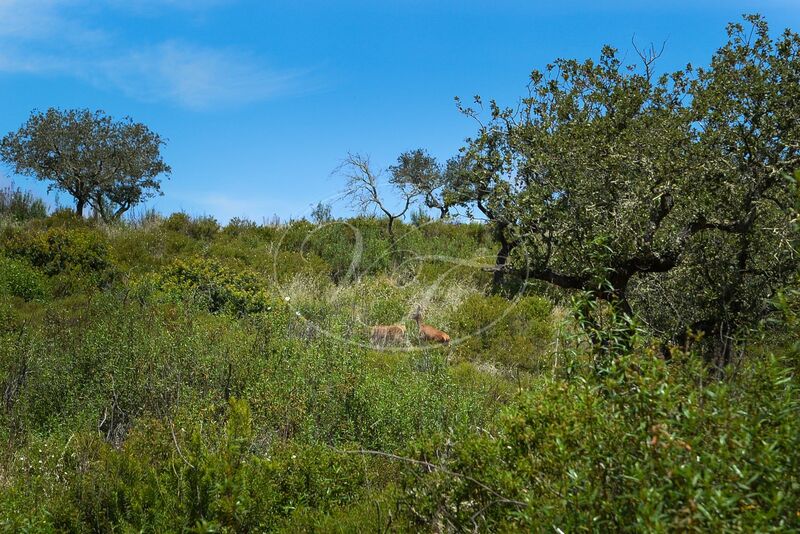 Vegetation on the hunting estate is formed by stone oaks, wild olives, many bushes, which gives the animals protection. 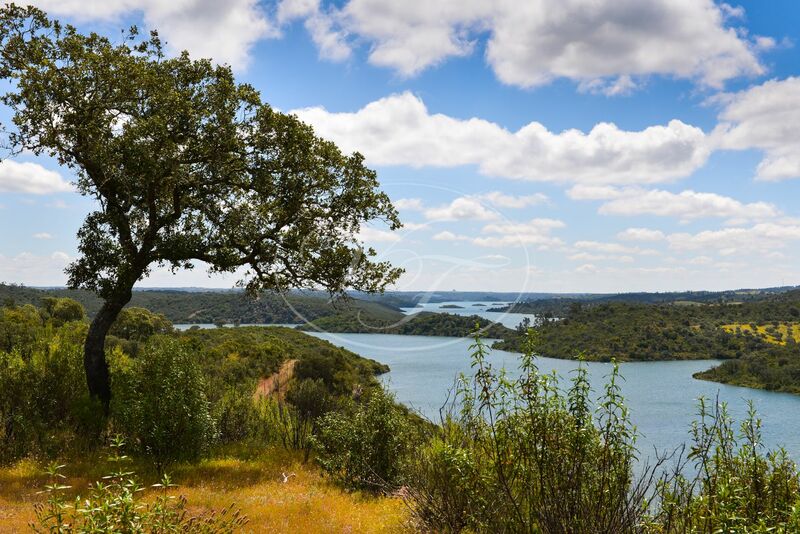 The water reservoir can be used for water sports, only by the adjoining fincas. including waterskiing, swimming, wakeboarding, canoeing and fishing. 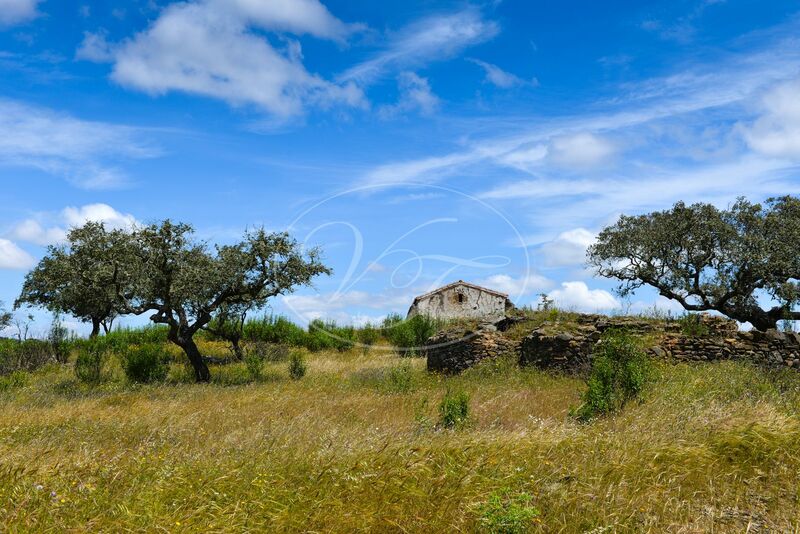 Furthermore the estate contains approximately 60 km of private tracks, and several stone-bordered ‘Corrales’. Ideal for horseback riding, mountain biking, and other outdoor sports. 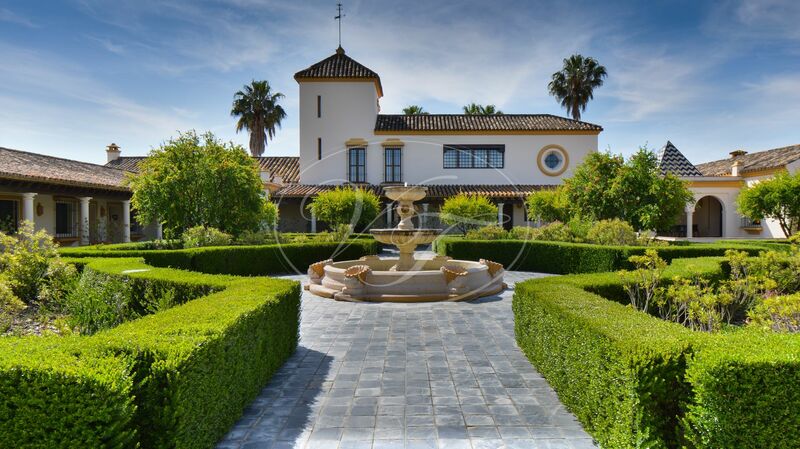 The original Andalusian hacienda was built around 1900. 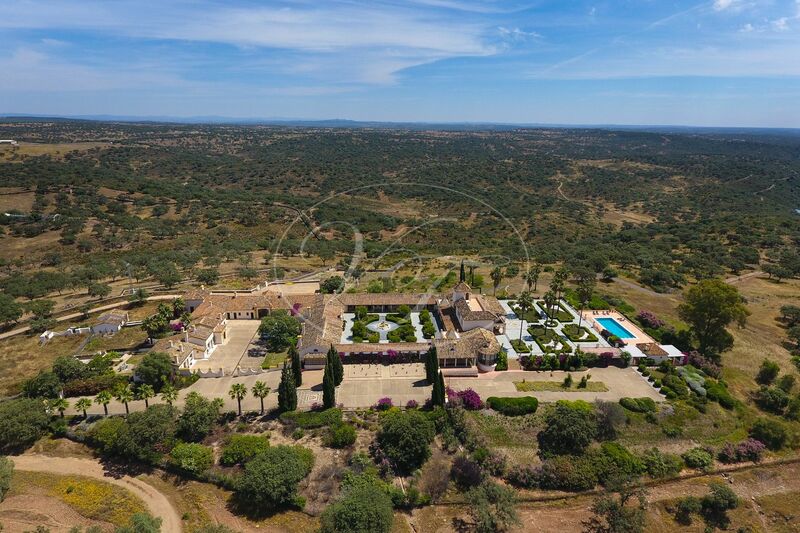 It has been completely reformed and extended in 2001 under the direction of the Architect Professor Manzano from Sevilla. 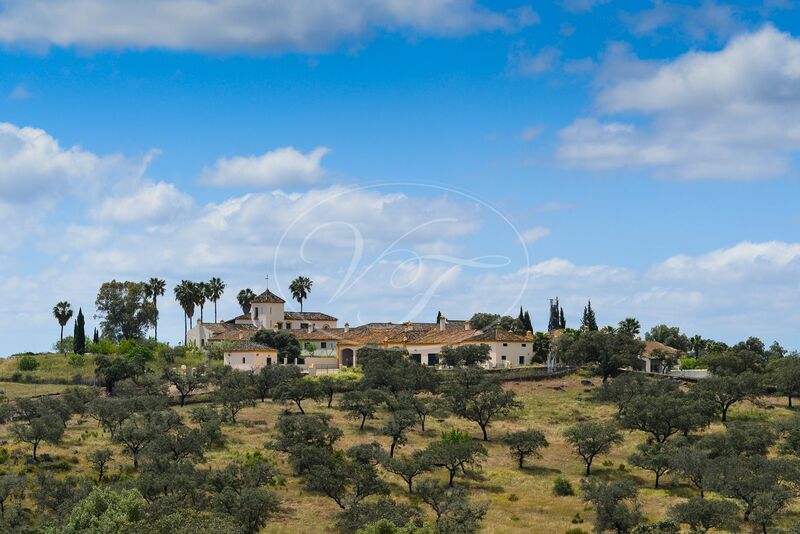 The hacienda is situated on a hilltop, in the centre of the estate, very private and boasting the most stunning views over the mountains and the lake. 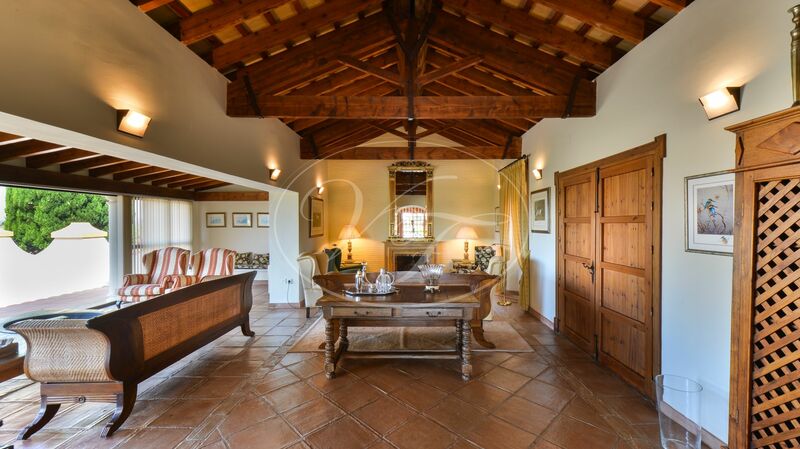 The built area covers 3.000m2, including the patios and is fully equipped and furnished to entertain over 30 guests. 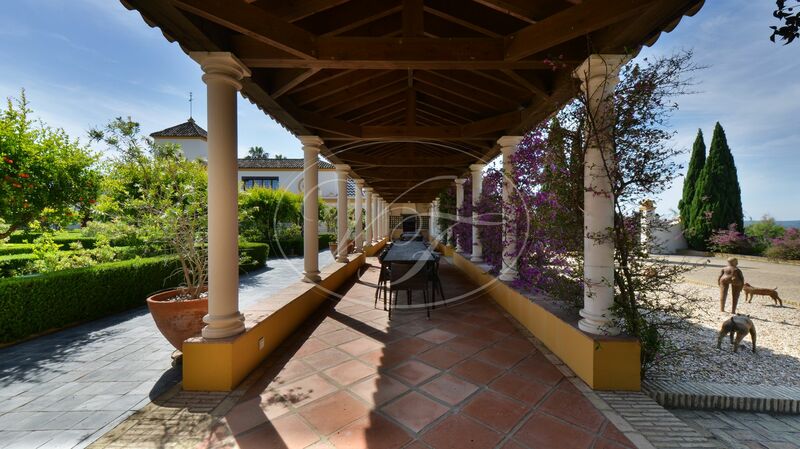 It comprises of various sectors, linked to one other by the typical Andalusian courtyards. 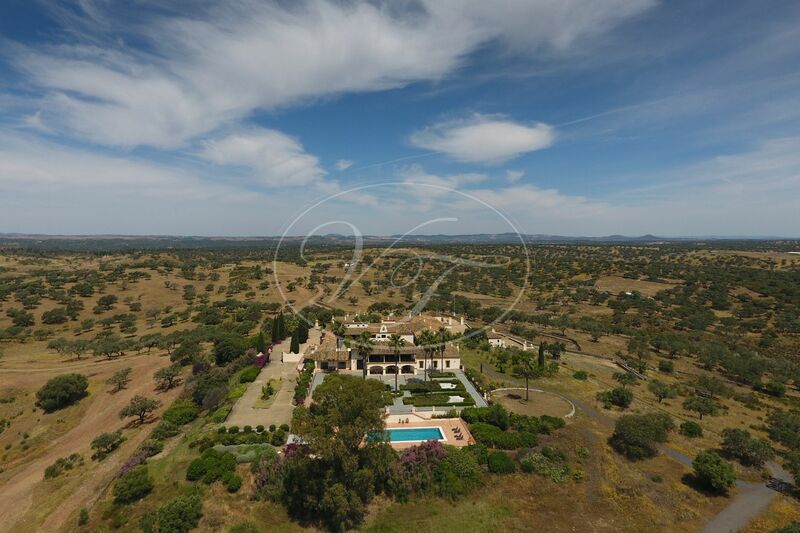 Owners and guest accommodation have 15 bedrooms ensuite, a dining hall, game room with a bar, guest lounge, several covered terraces, a 16m x 6m heated swimming pool, with pool house, extensive professional kitchen, utility rooms, laundry room, wine cellar, engine room, etc. 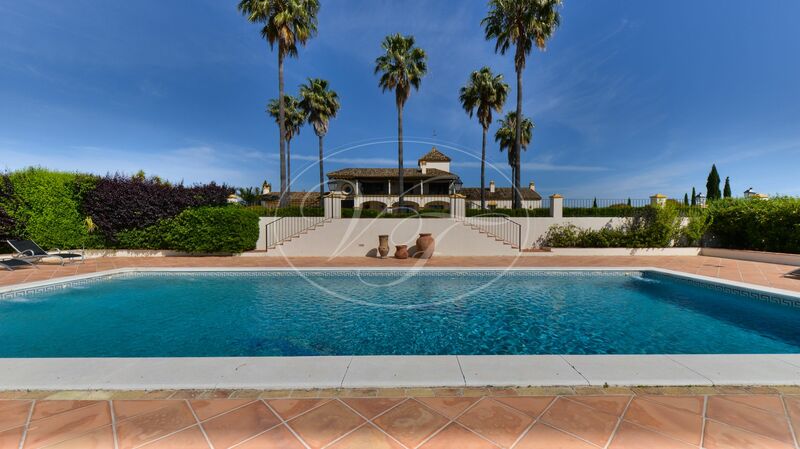 Outside garages, stables and equestrian facilities. Permanent and temporary staff accommodation has another 10 bedrooms. 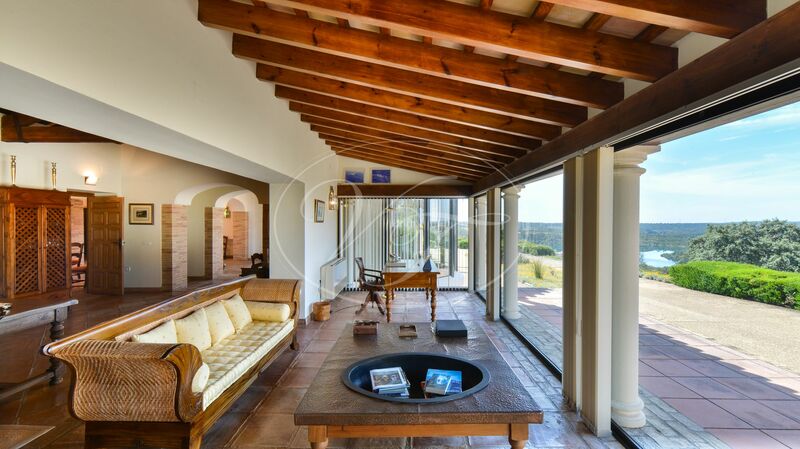 Guest accommodation is separated from the main residence, The private, main residence comprises of a large living room with fireplace build to enjoy the views. 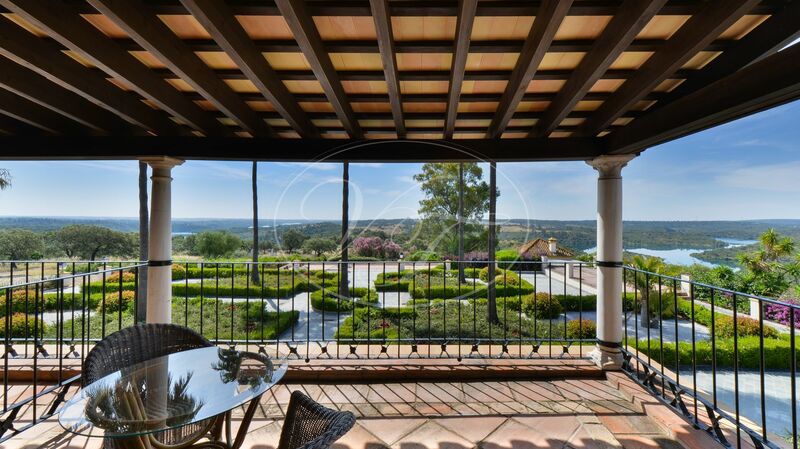 Opens to a large covered terrace overlooking the gardens and the lake. Fully equipped kitchen, utility and bodega. 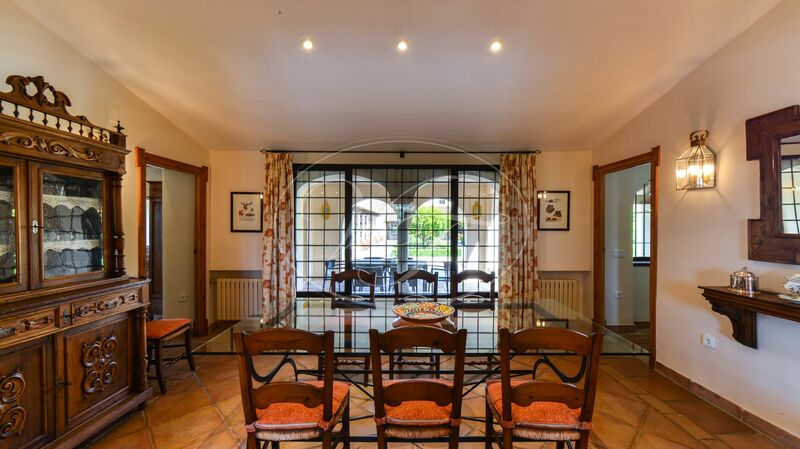 Dining room, study and TV room, guest bedrooms en-suite. 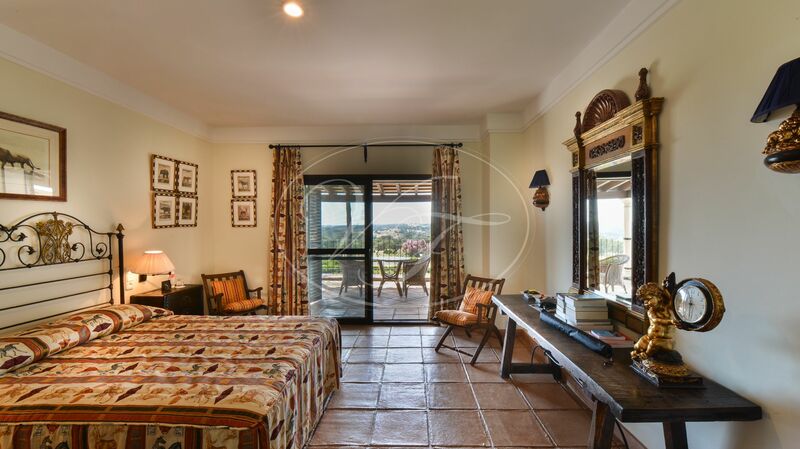 The first floor, comprises of 3 luxury owners suites, with terraces overlooking the patio, swimming pool and Lake. 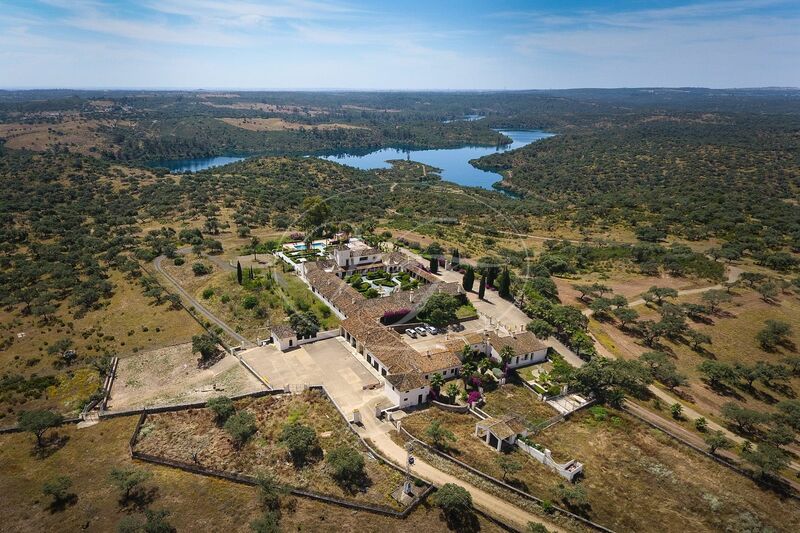 In the tower is a mirador, again overlooking the whole estate. At the inner patio are eight luxury guest suites with bathrooms. Seven of which have their own sitting area. The patio connects to the dining hall, game room and guest lounge. 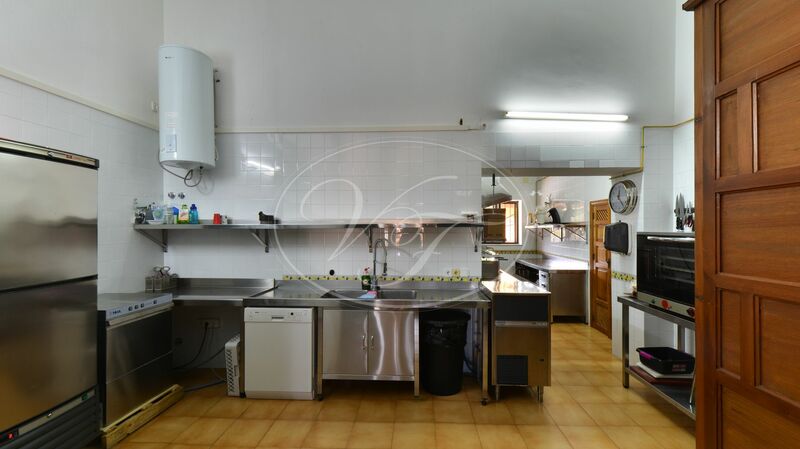 The hacienda includes a professional kitchen, a large dining hall to cater for up to 40 people. Staff accommodation. Two houses, one with three bedrooms and the other with four bedrooms. 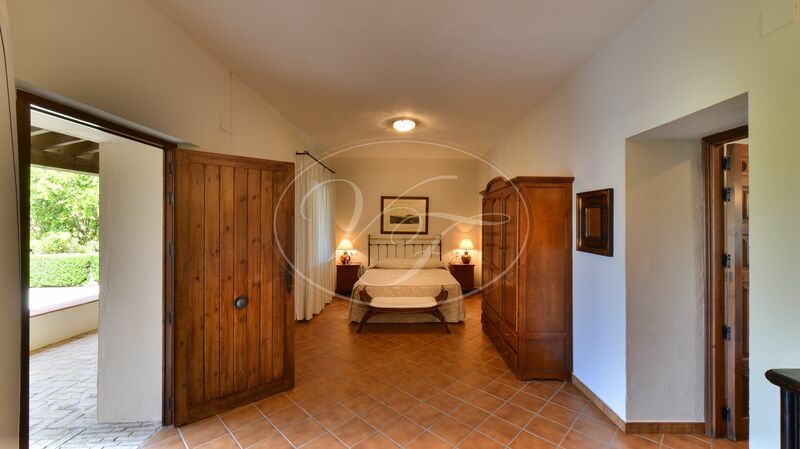 Two bedrooms en-suite for temporary staff. 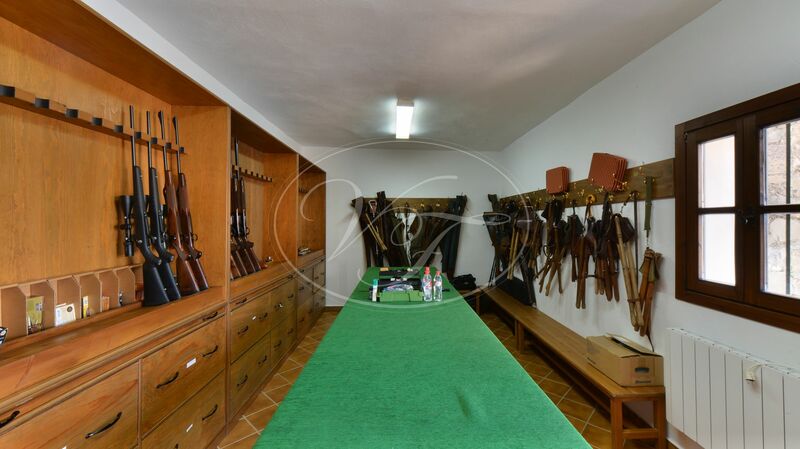 In this section, you will also find the guns room, drying room, cantina for personnel, large office for meetings, plus attic with the bedroom. 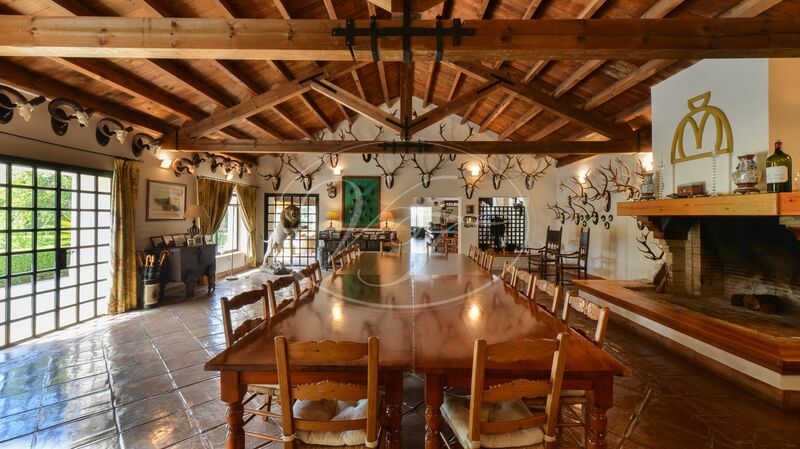 There are 3 open garages, 2 storage boxes, cold storage and butchers room, saddle and a hayloft, installation room. Outside 1 barn of 15×18 meters, 6 storage buildings. BBQ area by the lake with benches and shelter for sun and rain, 5 remains of old houses on the estate, that could possibly be rehabilitated for housing. Equipment is included: a Tractor 2006, and several other agricultural equipment and machinery; one bulldozer, five pickup Jeeps, three luxury Jeeps, three offload motors, a quad, a waterskiing boat and a twelve-person boat for group trips. Two kayaks, six bicycles, one laser sailing boat. All installations were newly installed in 2001, connected to mains electricity, for an emergency, there is a 35KW John Deere power station installed. Water installations are fed by 3 wells of around 100 meters deep. Cultural escapes to Sevilla, Huelva, Cordoba, Tarifa, many Atlantic marinas for sailing, fishing. 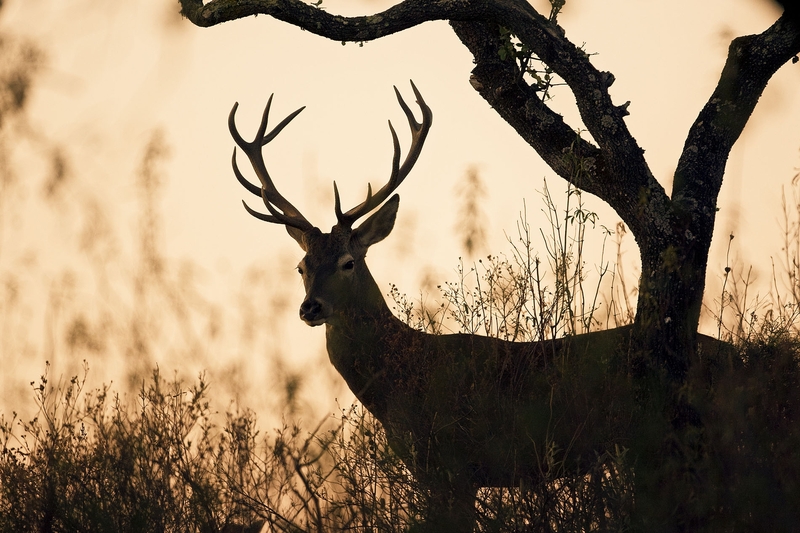 Cultural events as the El Rocio procession, Semana Santa, Feria de Abril and astonishing Nature reserves like Parque Nacional de Doñana. 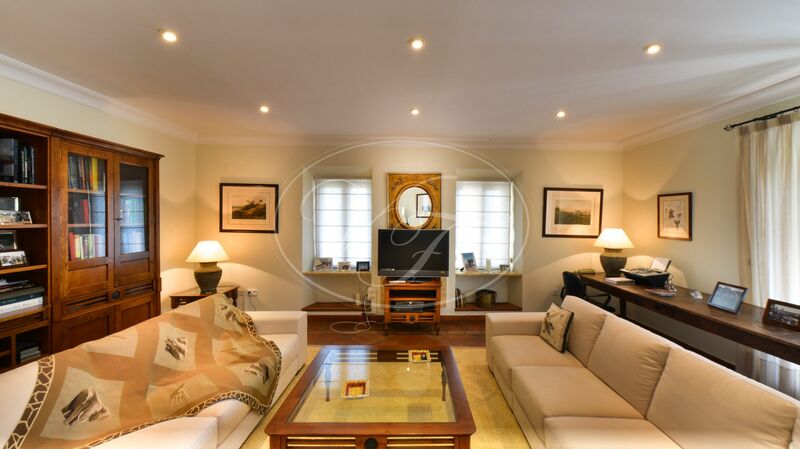 A very complete and well organised exclusive Estate sold completely furnished and equipped. 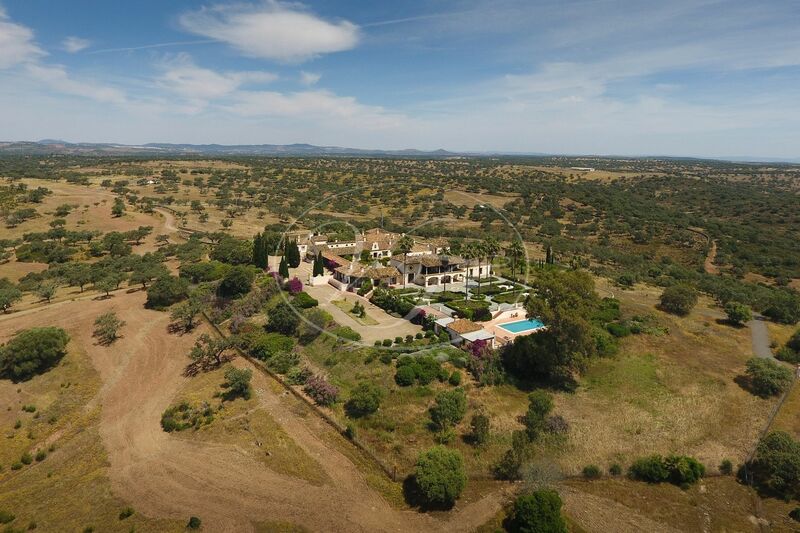 Please, send more information about ref 186-00603P, Estate in Huelva or similar properties.